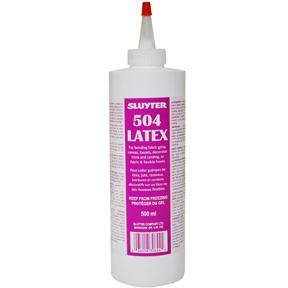 504 Sluyter Latex Adhesive was developed and is manufactured in Canada. Uses - Latex adhesive for decorative trims such as Gimps on upholstered furniture. Latex glues remain flexible in service and create a strong mechanical bond. Application - For Gimp to Fabric, apply a thin bead to the Fabric. While still wet apply the Gimp. For Fabric or Gimp to flexible foams, apply the adhesive to the foam surface. While still wet attach the fabric. Cautions - Use in well ventilated area. Keep container tightly closed when not in use. Keep from freezing. Description - Latex based white liquid adhesive for Gimps and Trims. Remains somewhat flexible in service. Features - BONDING LATEX ADHESIVE FOR GIMPS, TRIMS AND CLOTHS #504 Latex has a primary application of cementing cloth or fabrics to almost any other type of cloth, material, wood and metal. Firmly retains decorative scroll gimps in complex patterns and shapes. Squeeze tube container design allows careful placement of adhesive only where required. Water resistant. Type Of Product - Liquid gel type trim adhesive. Yes, this will work for your application.